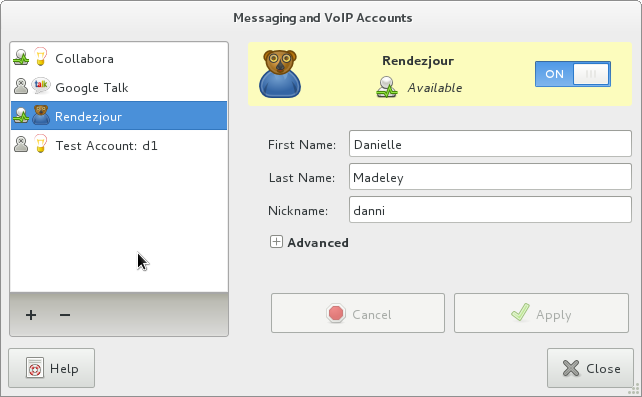 After looking at my screenshot of the Empathy accounts dialog yesterday, compared with the GNOME Online Accounts dialog, I realised that the Empathy dialog was missing the attractive GNOME 3 add/remove buttons. Also, I’m not really that wild on electric blue. If someone wanted to do a version of Adwaita in purple that would be really awesome. I am currently sat in Dubai airport on my way to the IM, Contacts and Social hackfest in at Collabora’s office in (real) Cambridge. 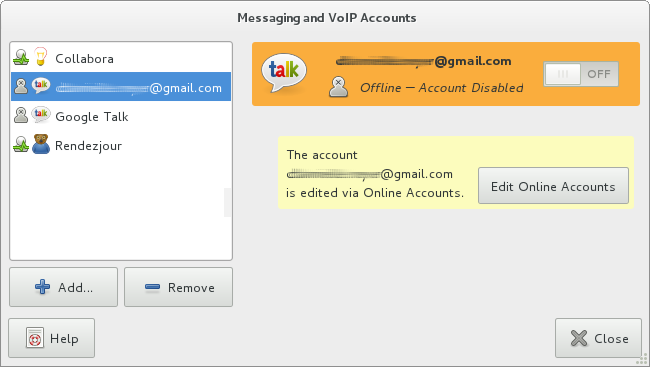 Hopefully this week will get some cool progress made it integrating Telepathy and Folks into GNOME 3. My attendance is sponsored by my employer, Collabora. In recognition of the occasion, I actually started running GNOME 3. I’m enjoying it, except for missing Cantarell1 and this focus follows mouse bug. I am looking forward to the reappearance of the world clocks. Also it seems you can no longer make the screen lock on suspend, which feels like a big deal, because I’m the kind of person to leave a sleeping laptop lying around. If no one already has a good solution to this, I might write a fix using a gnome-shell extension. It used to be that you could set different timeouts for screen blanking vs. screen locking. I’ve lived without this feature in recent years by remembering to press the lock-screen button on my keyboard, but I had this strange idea on the plane that screen locking can also be tied-in with IM presence. At the moment the screen blanks after the idle time, which is equivalent to the away status in Telepathy (the computer is idle, save some power, also if the user has sound turned off, she won’t see your text). Whereas I wanted the screen to lock automatically after an extended period of being away, the xa status in Telepathy? For the moment (it may change this week) Empathy is responsible for setting the presence in Mission Control, setting away in response to gnome-session and setting xa itself. Either the session could add a concept of extended away, which I could wire up to lock the screen. Or I could listen to the presence change from Mission Control. This could always be another shell extension.